The Favorites section of File Explorer is designed to hold the folders you use most often. It makes opening those frequently accessed parts of your drive that little bit easier. If there are new folders you want to add, or redundant ones you don't want to see, making changes isn't difficult (and the seconds you save will soon add up). 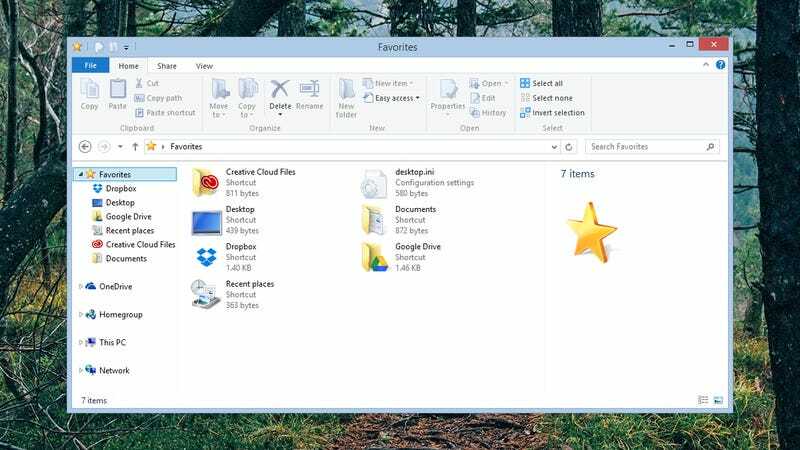 The Favorites menu appears in the navigation pane on the left of every File Explorer window. If you can't see it, open the View tab from the ribbon menu, click Navigation pane and make sure the option to show the pane and the Favorites list are ticked. Other entries you'll typically see in this left-hand window are your Homegroup, This PC and of course OneDrive. Any entry in the Favorites list can be reordered with a simple click-and-drag. You can get Dropbox up top, for example, or demote Creative Cloud Files down to the bottom of the list. If it makes you feel better then you can get them in alphabetical order. Click on the Favorites heading itself to make changes to the entries it includes. From here the Favorites folder works like any other folder. You can drag new locations in, or right-click and choose Remove to trim down the list a little. You can drag drives in or links to your cloud storage folders, it's really up to you. Remember that folders for Links, Searches, Contacts and Downloads all appear under your user account folder at C:\Users\... (as indeed does the Favorites folder itself). By the time you've finished reordering you should have quick access to all of the folders you use most often, unencumbered by all of the folders you don't. Remember this shortcut to your favorite places is available in every application running on your system, so it's going to come in handy time and time again as you use your computer.